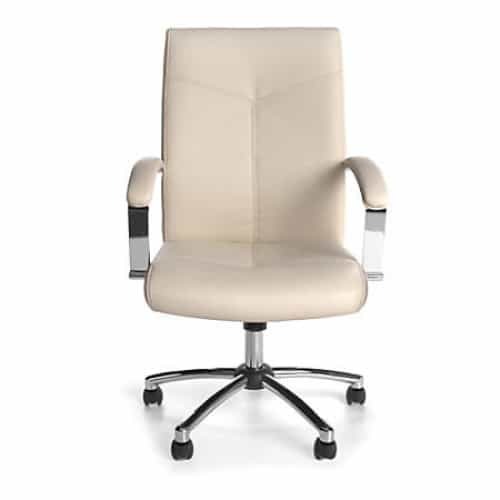 Minimize body strains at work with an office chair designed for support. Multiple adjustments make it easy to find an ideal position, so you can stay comfortable as you complete your entire to-do list. Overall Dimensions: 40 1/4 - 43 1/4"H x 24 1/4"W x 27 1/2"D.
Vinyl backrest and polyurethane seat provide durability and a sleek look. Frame is made with metal and polypropylene for strength. Tilt adjustment lets you find a comfortable position for working and relaxing. Synchro tilt and locking tension capabilities enable versatile personalization. Pneumatic seat-height adjustment makes it easy to reach your desktop. Padded armrests provide added comfort. 5-star, chrome-plated base measures 25" for stability.